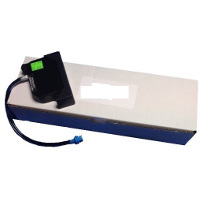 Collins Inkjet TWK-1818 / Complete H professionally remanufactured hybrid dye & pigment black inkjet cartridge designed for most Pitney Bowes, Neopost, Rena, Secap, Astro, Asmarc, FP Mailing Solutions, Kirk-Rudy and MCS envelope / address inkjet printers. Used for most basic stocks, including uncoated, matte coated and gloss coated. Has good darkness, dries well and has great decap.